Volume 23 of the Gabriel Wells Definitive Edition of Mark Twain's Works is The Man That Corrupted Hadleyburg and Other Essays and Stories. The contents of this volume are identical to the contents of the book issued by Harper and Brothers under the same title in previous uniform editions after mid-1917. (For the history of the shifting contents of this volume, see Chapter 25.) The Introduction for this book was written by Albert Bigelow Paine. THE greater number of tales and articles included in this volume were written during Mark Twain's extended European sojourn, which began in the spring of 1891 and ended in the autumn of 1900. It was an active period, for he had fallen heavily into debt, and it was only through his own efforts that he could hope for relief. He made a lecture tour of the world during these years, and produced two important books, Following the Equator and Joan of Arc, two representative books -- one of them, at least, a masterpiece. His briefer labors were some of them scarcely less important. "The Eskimau Maiden's Romance," "Is He Living or Is He Dead?" written during those hard days of '93-'94 when Mark Twain was struggling to save his firm from bankruptcy, have humor and fancy despite the trying conditions under which they were produced. But by far the more important features of this volume were those written in Vienna, when he had measurably conquered his financial problem. It was then that he wrote the article "About Play-Acting," and the one on "Diplomatic Pay and Clothes," and it was then, too, that he wrote the greatest of all his short stories -- if, indeed, it is not the greatest of all short stories -- "The Man That Corrupted Hadleyburg." This moral tale by Mark Twain has taken its place among such classics as "The Fall of the House of Usher," by Poe; "The Luck of Roaring Camp," by Harte; "The Man Who Would Be King," by Kipling; and "The Man Without a Country," by Hale. As a study of the human soul, its flimsy pretensions and pitiful frailties, it outranks any of these. It is a terrible arraignment of human weakness. In it Mark Twain allowed himself to jeer at the species without restraint. Human hypocrisy and rotten moral force were never stripped so bare, never so mercilessly jeered at in the market-place. For once Mark Twain could hug himself with glee in mockery of self-righteousness, knowing that the world would laugh with him, and that none would be so bold as to gainsay him. The Man That Corrupted Hadleyburg is one of the most scathing sermons on self-righteousness ever preached. Its philosophy that every man is strong until his price is named; the futility of the prayer not to be led into temptation, when it is only by resisting temptation that men are made strong -- these things were never more vividly, more glowingly presented. Certainly it is Mark Twain's greatest short story, and if the measure of a tale's greatness is to be estimated by the message it conveys to the human conscience, the tale that will surpass it is not likely to be written. "Hadleyburg,'' written during the winter of '97-'98, was first published in Harper's Magazine. Letters came to the author from every direction, most of them inquiring if the story was a true one, and asking for the geographical location of Hadleyburg. Some thought it was Elmira, New York, where for so many years he had made his summer home. But Hadleyburg had neither local geography nor circumstance, for Hadleyburg was the world, and Mark Twain, at sixty-three, having seen all the world and probed every human depth, had found some phase of the story's circumstance in every human soul. The frontispiece for the Gabriel Wells Definitive Edition of The Man That Corrupted Hadleyburg and Other Essays and Stories is a portrait of Clemens by photographer Napoleon Sarony -- a portrait that Clemens had previously referred to as "the damned old libel." James Allen St. John's illustration previously used in the 1899 uniform edition of Volume 21, The American Claimant and Other Stories and Sketches for "The £1,000,000 Bank-Note" is also featured. 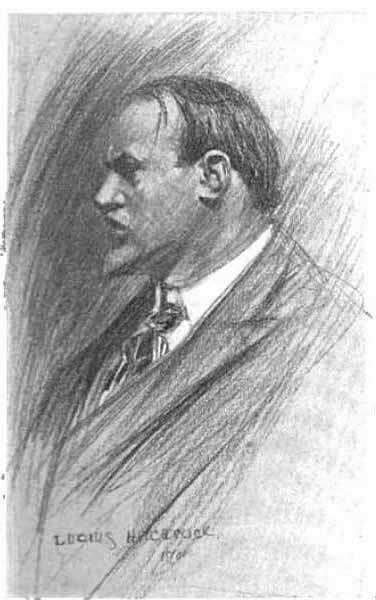 Two other illustrations by Lucius Wolcott Hitchcock are from original Harper's Magazine appearances. Lucius W. Hitchcock was born in West Williamsfield, Ohio. He first studied art under A. T. Van Lear and later in New York at the Art Students' League. Hitchcock then spent time in Paris as a pupil of Benjamin Constant, Jules Lefebre, and Jean Paul Laurens. When he returned to the United States, Hitchcock accepted a position with the School of Fine Arts in Buffalo, New York. In addition to teaching, he was a successful illustrator for leading magazines such as McClure's, Collier's, Scribner's and Harper's Magazine. Mark Twain's "The Man That Corrupted Hadleyburg" appeared in the December 1899 issue of Harper's Magazine accompanied by Hitchcock's illustrations. The story was published in book form in June 1900. The January and February 1902 issues of Harper's Magazine featured Mark Twain's "A Double-Barrelled Detective Story," also illustrated by Hitchcock. It was issued as a book in April 1902. The Gabriel Wells Definitive Edition of The Man That Corrupted Hadleyburg and Other Essays and Stories features two of Hitchcock's illustrations -- one for "The Man That Corrupted Hadleyburg" and one for "A Double-Barrelled Detective Story." Armstrong, Regina. "The New Leaders in American Illustration," The Bookman, April 1900, pp. 140-148. "Lucius Hitchcock, Illustrator, 73," The New York Times, 19 June 1942, p. 23.